Are you struggling to draw springs in either 2D or 3D? The Spring app from CAD Design Software makes that struggle a thing of the past! 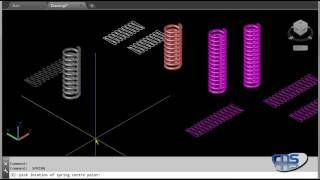 This cost effective app enables you to draw either 2D or 3D springs in 3 easy ways. You can use a variety of options,height and number of coils,height and pitch,or number of coils and pitch to conveniently define the spring. Download your free trial today!